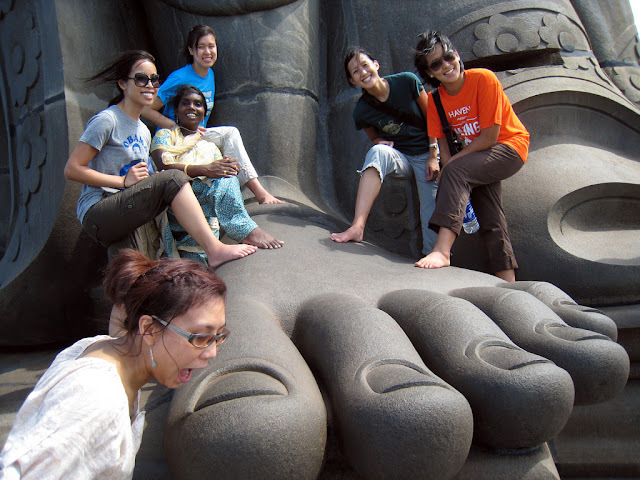 Referred to as the feet of Bharat Matha(Mother India), Kanyakumari, Mentioned in the Ramayana, Mahabharata, and the Sangam works Manimekalai and Puranaanooru. It is believed that the image of Kanyakumari was installed and worshipped by Sage Parasurama, who is credited with reclaiming Kerala from the ocean, and building several shrines. Kanyakumari is one of the few places in the world where one can witness both the sunset and sunrise at the same beach due to the geography. Kanyakumari is the southernmost point of peninsular India and the meeting point of three oceans-the Bay of Bengal, the Arabian Sea and the Indian Ocean. Legend has it that the celestial Sage Narada, fixed the midnight hour as the auspicious time for the wedding. When Shiva's procession reached a site by name Vazhukkumpaarai, a rooster crowed, hearlding daybreak, and that Shiva assuming that the auspicious hour was past, returned to Suchindram. The disappointed Goddess decided to spend her life in Kanyakumari as a virgin, and that all the food prepared for the wedding was laid waste and that it turned into the colored sand seen on the southern shores of the subcontinent. The demon Banaasuran upon hearing of Shakti's story proceeded to Kanyakumari to win her hand in marriage by force, and this led to a fierce battle in which he was slain by her. 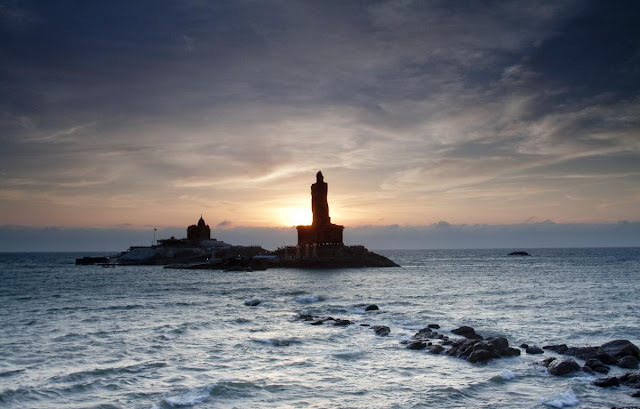 Kanyakumari has been a great centre for art and religion for centuries. It was also an area of great trade and commerce. It was ruled by the Cholas, the Cheras, the Pandyas and the Nayaks. The architectural beauty of the temples in the area are the works of these rulers. Later Kanyakumari became part of the Venad kingdom with its capital at Padmanabhapuram. The king of Venad, Anizham Thirunal Marthanda Varma, established Travancore by extending his domain further north up to Azhva, during his reign from 1729 to 1758. By this, the present Kanyakumari District came to be known as Southern Travancore. In 1741, Maharaja Marthanda Varma defeated the Dutch East India Company at the famous Battle of Colachel. Kanyakumari was under the rule of the Paravar Kings till the downfall of Pandyas, and later by kings of Travancore under the overall suzerainty of the British until 1947, when India became independent. Travancore joined the independent Indian Union in 1947. The reign of the Travancore royals came to an end. Under Travancore rule, the town, and the modern administrative district that bears its name, Kanyakumari District, progressed both socially and economically. Still a significant part of population study and speak Malayalam as their mother-tongue. The culture followed by Kanyakumari people is mixed and has more influence from Travancore. Kumari Thanthai Marshal Nesamony was instrumental in the merger of Kanyakumari district with Tamil Nadu in 1956 during the linguistic reorganisation of states. Kanyakumari was integrated with Tamil Nadu (then known as Madras State) as per the language-based reorganisation of States. Christianity arrived in South India around AD 52 through St. Thomas, one of the twelve Apostles of Christ. However, European missionaries, who arrived in the 16th century, propagated Christianity in the area. St. Francis Xavier (April 7, 1506 � December 2, 1552) was the pioneer in preaching Christianity in the present day Kanyakumari district. Islam is believed to have entered the southern part of India through Kanyakumari during the early part of the eighth century AD through traders and missionaries who came through sea-routes. Islam, Christianity and Jainism have also contributed to the architectural wealth and literary heritage of the region. The black stone image of Kanyakumari in the sanctum bearing a garland is an enchanting one. Of particular significance is the glittering nose ring that is visible from a distance. Legend has it that the light emanating from this nose ring misguided arriving ships and caused them to crash onto the rocky coast. There is a door now, to the east of the shrine which is opened only five times a year. 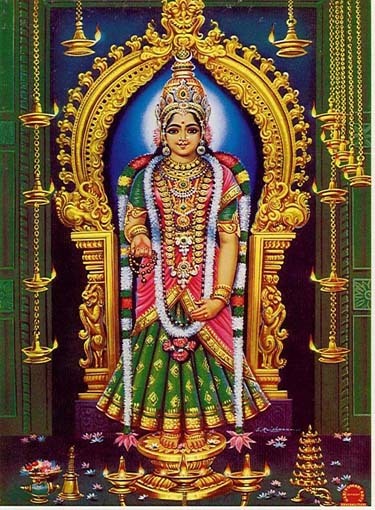 There are also shrines to Vijayasundari and Balasundari, friends and playmates of the Goddess in her youthful form. There are a total of 11 theerthams associated with the temple in the ocean surrounding the area. 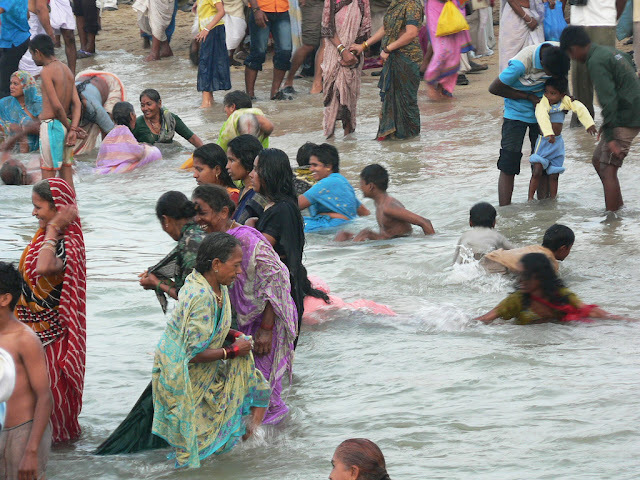 The confluence of the seas, at the southern tip of the subcontinent has been held sacred for centuries. Worship services are carried out here, throughout the day, in a manner similar to that in Keralite temples. It must be remembered that Kanyakaumari was a part of the erstwhile Travancore kingdom. The eastern door is opened also on new moon days in the months of Thai, Aadi (Capricorn and Cancer), during Navaratri and in the month of Kaartikai. The destruction of Baanasuran is enacted on Vijaya Dasami, the concluding day of the Navaratri festival, where an image of the deity is taken in procession on a horse mount to a nearby village - Mahadanapuram. The great Indian Philosopher Swami Vivekananda�s memorial is built in a small island like rock 200 meters from the shore. A very great building and other halls are constructed in this rock. Actually it is a turn rock where this memorial stands. There is a meditation hall where people who wants to meditate in a calm and composed atmosphere can perform their meditation inside it. Boat facilities are available for the tourists to visit this beautiful memorial spot. Swamay Vivekananda came to kanyakumari on 24.2.1892 before his departure for Chicago to participate in the World Religious Conference in 1893. He sat on meditation on this rock for two days and became a powerful spiritual leader and philosopher. 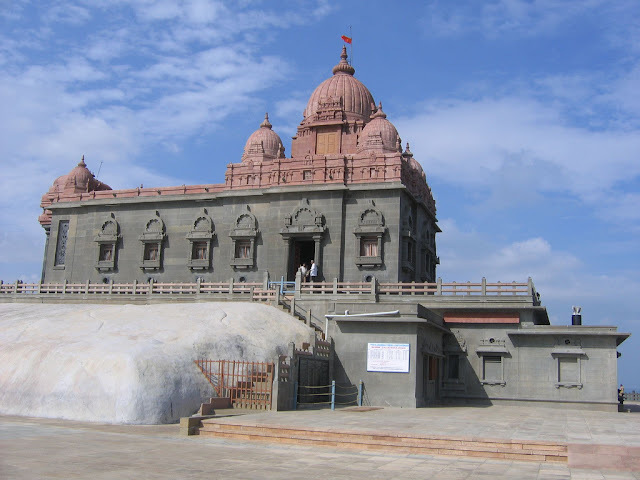 Vivekananda Rock Memorial has been built in 1970 and is a blend of various architectural styles of India. The memorial was constructed in 2081 working days with an average of about 650 men working under the supervision of Sri. S.K.Achari. The memorial consists of tow main structures. The entire memorial mandapam is similar to that of Sri Ramakrishna Temple at Belur and the entrance is designed on the style of Ajanta and Ellora cave temples. There is a belief that the original Devi temple was built on this rock or somewhere near this and the rock itself was part of the mainland. The sea might have eroded the main land and turned the rock into an island, resulting in the shifting of the old temple to the present site. This rock is approachable only by boat which provides a pleasure cruise into the sea. In the main hall there is a life-size bronze statue of Swamiji in his standing �parivarajak� posture. Adjoining the main hall is the dhyana mandapam where devotees can sit and mediated in a serene atmosphere. On this rock there is a small projection resembling human foot which has been revered as Sripaadam. According to legends it was on this rock that Goddess Kanyakumari did her penance. This special significance and sanctity attached to this rock might have prompted Swamy Vivekananda, an ardent devotee of Kali, to venture across the sea for his long meditation. 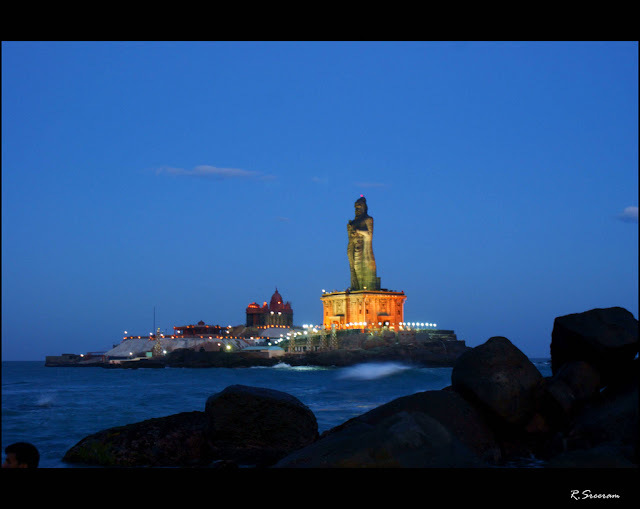 This statue of the great Tamil poet, Thiruvalluvar is built exactly of that of the statue of Liberty in America. 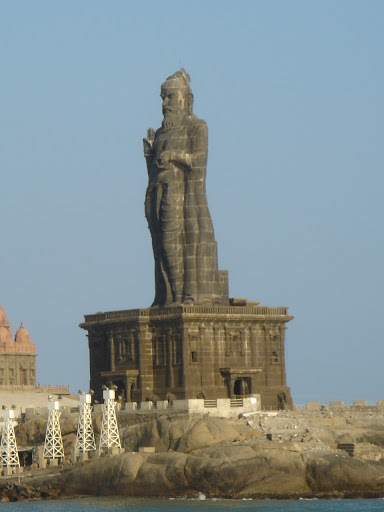 The stone statue is 133 feet high representing the 38 chapters in the first part of the Kural (Virtue) and the 95 ft statue represents the total chapters in the second and third parts of the Kural, Wealth and Love. Thus the statue symbolizes the themes of wealth love based on virtue. The pedestal is surrounded by an artistic mandapam known as alankara mandapam. Surrounding this mandapam stand statues of ten elephants. To help the visitors to worship the holy feet of the saint 140 steps are constructed inside the mandapam. The foundation stone for the statue was laid in 1979. Five hundred sculptors were engaged for this work under the able guidance of Dr. Ganapathi Sthapathi and the work was completed in 1999. The state was inaugurated on 1st January 2000 by Dr.Mu. Karunanidhi, the then chief minister of Tamil nadu. It is said that the burnt ashes of the late father fo the nation Mahatma Gandhi was put in a pot and kept in the shore for people to see before immersing it in the tri seas. The place where the pot was placed, later a memorial place was constructed for him. The sunrays pass through the building and fall exactly where the ash pot was placed, on the particular day i.e. October 2nd. It is a testimony to modern architecture. Chidaraal is a place in Kanyakumari district, which is 45 kms away from the capital city. There is a Jain Temple in this place which is exactly on the hill rock. The temple has the sculptures in it that are of the Jain Thirtankaras. The temple in chidaraal and the sculptures found in the temple are preserved by the Archaeological survey of India. They have maintained this in good condition. This temple is said to be 1000 years old. As history speaks of the temple, it is said to have been constructed by the Great Chola King Raja Raja cholan. The architectures and inscriptions purely resemble the Chola Style architecture. This temple is located near the railway station. In this temple tourists and visitors can find 16 inscriptions that are said to have been inscribed during the 11th century A.D. Tourists are allowed for visit from 6.00 A.M. to 11.15 AM. and from 5.00 pm to 8.45 p.m. There is a temple of Lord Vinayaka in this place called Keralapuram. This place is located near Thukalay. The idol of the Lord Vinayaka confuses the pilgrims. The uniqueness about it is that it changes its colour. It is found to be black for the first six months and then changes its colour to white for the next six months. 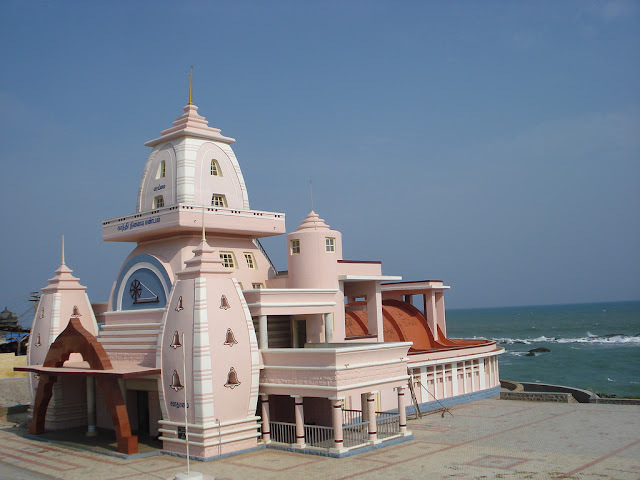 This temple is located near the sea shore and it is a beautiful scene for visitors who visit this site. Mythology says that Goddess Devi performed prayers to get Lord Shiva�s hand for marriage. When she did not get in hand to marry Lord Shiva, she promised ever to be a virgin which means Kanya in Tamil. The idol of the goddess in this temple has a nose ring studded with diamond which is visible even from the sea. Nagarcoil is the capital city of the Kanyakumari district. There is a Nagaraja temple, located here, which is very famous. The pillars in this temple are inscribed with the figures of the Jain Theerthangaras, Mahavira and Parsavanathar. The entrance to this temple is exactly the replica of the Chinese architecture of a Buddhist Vihar. Suchindram is a pilgrim town in the Kanyakumari district. There is a Thanumalayan temple in the place. This temple is a treasure of arts. The artistic skills of the architects, sculptors and craftsmen are found through their creation of the musical pillars and also the gorgeous 18 feet statue of Hanuman, The deputy of King Rama. The temple is dedicated to the Hindu Trinity Vishnu, Shiva and Brahma. The Hanuman Statue and Vinayaki (The female carving of Vinaya) are found exuberantly. Thiruvattar a town of the Kanyakumari district is 70 km away from the city headquarters. The finest specimens of temple art, architecture and crafts are found here. The wall paintings are worth enjoying for the tourists. This temple in Vallimalai is constructed on a rock cut hill which is 300 steps atop from the plains. The temple as a whole is located inside a cave. The cave temple is found to be built in 3 successive levels. The elevation increases level after level. The shrines of Vinayakar and Kasi Viswanathar are found in this temple. The construction in this temple is attributed to the Pallava and Nayak rulers. Erayoor is a place located at Sriperumputhur. There is a Siva temple in this place. The idol in this temple is named as Irul Neekeeswarar which denotes that, God who removes the darkness of life. The temple consists of five holy tanks. The five tanks are namely Siva Theertham (Mahadev Tank), Bramma Theertham (Pookulam), Vishnu Theertham (Neerkulam), Rudra Theertham (Theeradikulam) and Maheeswara Theertham (Allikulam). The holy tree of this temple is Kadamela. According to legends Virutham, moon god, Sun god and Agarthiya worshipped the supreme God - Lord Shiva, in this temple. Kamaraj was regarded as the King Maker of India. He had influenced many a political event in the country. He was born of a humble family and then went on to become the chief Minister of Tamilnadu. He was a hard worker and a political acumen. This memorial was dedicated and built for the great freedom fighters hardwork and achievement on 2nd October 2000. This memorial is located near the Gandhi Memorial. This museum is located on the beach road. The collection of sculptured artic rafts and crafts of South Indian temples are preserved in this museum. This is one of the tourist�s must see place. Jeevanandam was one of the fore runners of the Marxist movement of India especially in Tamilnadu. He represented in the 1957 election contesting for washermenpet in Chennai and proved to be an emiment Parliament member. A memorial was built in respect of Jeevanandam on 19-04-1998 at Nagercoil. The memorial has the statue, the life history and photograps of Jeevanandam, displayed in it. Saikuthambi Pavalar was born on 31-07-1874. He had a good knowledge of Tamil grammar and literature. He performed the �Sathavathana programme� in the presence of the Tamil scholars on 10th March 1907 and was appreciated. He was a freedom fighter, died on 13-12-1950. His memorial was built and opened on 26-09-1987, at Idlakkudi Kottar in Nagercoil. This memorial is located 30 km away from Kanyakumari. This place is of historical importance. The great revolutionary Velu Thamby Dalawah, who was the general (Diwan) of Travancore was born here. He rose and fought against the British supremacy in India. His home located in Thalakulam village was ransacked by the Britishers. He used his weapons and other belongings to fight against the Britishers kept in this place. This is located 40 km away (North west) of Kanyakumari. There is a five beach in this place. There is a lighthouse in this shore and it is a place perfect for relaxation. Sanguthurai, a beautiful beach resort is 10 km away from Nagercoil. It is a convenient spot for the local people. There are no infra structure facilities till now, but the district administration has sanctioned Rs.6 lakhs to build parks and entertainment buildings. The work of construction is complete. There are also plans to put up few shops for women self Help Groups, wherein tourists can buy the necessary things they want. This is one of the beautiful natural beaches located in the district which is 10 km away from Kanyakumari. The water in this beach is shallow and we can find many sand dunes in the shores. The district administration has taken steps and developed this wonderful natural beach into a five tourist spot. The new laid coastal road leads the tourists to this spot. The beautiful site that the tourists watch along the way to this spot enthralls them with joy. This place is located on the west coast, near painkulam village which comes under the revenue of Vilavancode. The beach here is a beautiful site because there are huge coconut groves near this beach. It is said that it was a major trade centre during the ancient days, specifically Arabra. The non-salty water from the Thamiraparani river enters into the sea through this beach. One can enjoy the boat ride on the back waters of the river. It is 35 kms far from Nagercoil and 54 km from Kanniyakumari Bus transport is frequent to this place. This place, Thekkurichi is a very small village. This is located in the West Coastal area. The seashores are calm and sereve in this beach. There are umpteen number of casnarina trees near the shore which provide shades and it is a joyous atmosphere. This Bay watch is a water Theme park. This is 2 km away from Kanyakumari on the Kovalam Road. The park is taken care and maintained by Sree Bhadra parks and Resorts Ltd, Thirssur in Kerala. Things found here are crazy chairs, Flying Elephants, Hotel Tea cups, Cape train, Multiple Splash, Milky Way, crazy cruise, Aqua shuttle, Family pool, wave pool and sky train. It is open for visitors from 10 am to 7.30 pm. The entry ticket for children is 150 rupees and 200 rupees for adults. This fruit farm is 2 km away from Kanyakumari on the way to Nagercoil. In this fruit farm there are variety of fruits, hundreds of plants and different species of trees found. The farm can be visited between 9 and 11 in the mornings and 1 to 3 in the evenings. Saturdays and Sundays are holidays. This is a rare bridge found in Kanyakumari. This Hanging through in Mathur is the tallest and the longest of the trough bridges in Asia. Its height is 115 feet and has a length up to a Kilometer. It was constructed in 1966. Mathur is a hamlet of Aruvikkarai revenue village of Thiruvattar Panchayat Union. This bridge is built across the Parazhiyar River at a cost of 12.90 laths. It is built from one hill to another hill. There are 28 pillars in it. The Late Chief Minister Kamaraj built it for the goodness of the people as a drought relief measure. Now there is a children�s park and bathing platforms are put up on the banks. This hill which is the abode of medicinal herbs is a part of the Western ghats. Mythology says that Hanuman was carrying the Sanjeevi mountain from Mahendragiri to Srilanka to heal the fatal wounds fo Lakshmana, the brother of the epic hero Rama. On the way, a piece of rock feels here and named as Maruthuva Malai. It stretches for a kilometer and the altitude is 800 feet. It is located 11 km away from Nagercoil. This place is 3 km away from Kanyakumari. The place is calm and peaceful. This is due to the power of the sun and the moon. The five day to visit this place is on �Chithra pournami� a full moon day in the month of April. This was the capital of Travancore till 1798 A.D. This was the ancient seat of the Travancore rulers. This palace is located 37 km away from Kanyakumari. The palace inside this fort covers 6 acres of land area. The antiquities, the armony of the royal families, the Ramaswamy temple near the palace, 45 panels of carvings from the Ramayana can be found inside. This is a historical and gallery. This gallery has beautiful portrayals of many great freedom fighters and leading personalities and a treasure of manuscripts also. This trust is near the railway station. Visitors are allowed from 9.30 in the morning till 9 in the late evening. The entry ticket for students is just 10 rupees. This wax museum is the first of the Indian Wax museums. This wax museum is near the Baywatch Theme park. This was opened for visitors to see from 24th December 2005. This was built in the same style of Madame Tussand in London. This is built to attract tourists from all over the world. The entry fee to the park is rupees 200 but an entrance fee of 20 would do to visit the museum alone. The headquarters of the Vivekananda movement or society ie the Vivekananda Kendra is situated just a kilometer far from Kanyakumari. This is a vast land area, with many buildings, halls and other things. There is a statue of the Swami portrayed as a wandering monk and there are some unique pictures preserved here. The vast area of the landscape, the seashore, the Vivekananda Memorial and the Thiruvalluvar Statue can be seen clearly from the telescope in this view tones. In the mornings from 5 am to 7 pm in the evening the visitors can have a view on the telescope. The entry ticket is rupees 2 for children and rupees 3 for adults. This place is 6 km north-east of Kanyakumari. There is a granite fort located in this place. This along with the other line of ramparts are terminals to the south Travancore. It was built by King Marthanda. This was built in defense, to protect, Nanjil Nadu. The fort is located in a three and half acres land area. The fort walls are of 25 feet high. There is a parapet which is 29 feet thick in the front side and 18 feet at the corners and 6 feet at the rears. This was very strongly built through the orders of De Lennoy, during the reign of King Marthanda. This fort is an old monument of the state. It was built during the king Marthanda Varma�s rule during the 18th century. This fort has a fountry for casting guns. Inside the fort is the De tennoy�s tomb. De Lennoy is a Dutchman. In 1741, the Dutchmen were defeated by King Marthanda in a battle held at Colachel. De Lennoy was one among the 24 prisoners who were prisoned in this fort. Some became close to the king. They trained the soldiers by the European method of warfare. The fort is allowed for visitors during daytime. It is located 34 km away from Kanyakumari. Alternatively, if you cannot reach Thiruvananthapuram directly from your place, you can reach Chennai(Madras) the state capital and then take either train or bus to reach Kanyakumari. Note that travelling to Kanyakumari is a bit tiresome via road, especially for Westerners, as the travel time is about 14-15 hours and the climate is pretty hot (30-35 degrees during summer and 25-30 degrees during winter) through out the year. Insist on a II tier air-conditioned coach as this is pretty cheap, about Rs 1200 (US$27). A local flight travel to Thiruvananthapuram is also a viable option, but the ticket prices are slightly higher, ranging from Rs. 1500 and can go up to anywhere around Rs. 5000. In India, the faster you book/plan your travel, the more you save on tickets. Very well connected and serviced by rail to all major cities in India like Chennai, Trivandrum , Kochi,Bangalore, Bombay, New Delhi, Kolkata, Coimbatore etc. And from here starts second longest train route in the world, Kanyakumari to Jammu. Buses are frequently available from Thiruvananthapuram,the closest major transport hub. Long distance buses are available from Chennai (Madras), Coimbatore, Madurai etc. Tourists can buy a lot of interesting items ranging from, straw hats, conches, sea shells, cheap electronics etc., There are some small shops where one can get a customized conch with name or quotes inscribed. These items can serve as a memorable item of your trip. Electronics available at Kanyakumari are dead cheap but, since all of them are imported from china, the quality of them are always sub-par. It's always good to avoid the electronics shops and the associated hagglers. Hair bands and clips made of coconut shells are worth the money and you may have to ask one for to the shop keeper if one is not available at the display. Star fish shells (for decorating your indoors), sea shells of various sizes, kaleidoscopes, colourful sand packets(not artificially colored), collected from different parts of the beach, used specially for decorating your indoor showcases, are also available. The cost of majority of these commodities range from Rs 20 (0.5 US$) to Rs 50 (1.1 US$), and never cross a 100. The food in Kanniyakumari is more of the classic South Indian style. It is mostly vegetarian, and maybe even some Tamil favorites including iddlis, sambar, dosai, and related are available. Typical South Indian vegetarian food is available. In some cases, they may serve you the food on the traditional banana leaf. South Indian food is more of an acquired taste for some people from the Western part of the world. It is different, but still good. Do not expect much as far as Western style breakfast foods or western style foods. Meals available at Kanyakumari are of the classic South-Indian type with rotis (roasted unleavened flatbread...perhaps similar to Mexican style wheat tortillas). North-Indian style meals are available in some Rajastani/Punjabi style restaurants. A one time meal usually cost around 25 Rs (0.5 US$). Kanyakumari has a lot of tender coconut shops selling tender coconuts for Rs. 10. (US$ 0.2). The orange variety of tender coconut, which is plentiful in this area and is priced the same, is worth trying as it's much tastier than the green coloured one. Avoid bringing alcohol to the beach as this place is a pilgrim centre and it's considered taboo to booze. Though there are a lot of fresh juice stalls, it is perhaps best to avoid them as the stalls are seldom clean and the ice they add to the juice may be contaminated. It may have many water-borne diseases of the digestive tract. Bottled drinks or tender coconut are readily available, and usually safe to drink. Note that bottled drinks are always priced higher (about Rs 2 to Rs 5 higher) than the MRP in these areas. Of bottled drinks, ThumsUp (Cola flavored) and Limca (Lime flavored), both branded by The Coca-cola company are worth tasting as they are tailored specially for the Indian market. There are numerous hotels, residencies etc. in and around Kanyakumari and therefore, staying over is not be a problem. But there are agents, touts and brokers in every nook and corner looking for unsuspecting tourists. Eschew buying or booking rooms from them, as many a time you end up paying a lot more than the actual price. Vivekananda Kendra can be a good option for people looking for a decent, yet cheap accommodation, but it's around 3 km from Kanyakumari. Prefer hotels near the beach especially if you want to watch the sunrise right out of your bed! Note that, you should quote this preference when booking the room or else, you'll always be given a room without a window opening out to the sea. Moreover many a times, these rooms are in great demand and you'll find yourself shelling a extra 400 - 500 Rs (~10 US$)for such a room. Hotel Sea View, Hotel Sangam and a couple of other hotels offer such rooms and the rent is about Rs. 1100 (~ 25 US$) for 12 hrs. Note that many rooms are priced for 12 hrs and not per day especially during the peak season.